Goal: Identify key relationships among purchased items. •For example: A customer who purchases a jar of Peanut Butter and a jar of Jelly, would likely purchase a loaf of Bread. 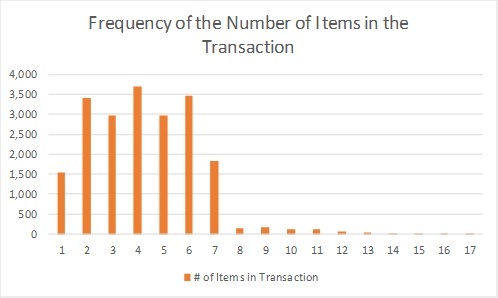 The table and the graph above show that people most often purchased 4 items together at a rate of 18% of all transactions. The second most frequent amount was where people purchased 7 items together at a rate of 16.8% of all transactions. Purchasing Relationships: The point of looking at the transactions is to discover relationships among products that may not be intuitively obvious. When these relationships are found, the store manager may capitalize on this knowledge by re-arranging product placement or offering coupons for item B that are tied to the purchase of item A. With our example case, the mathematical model produces the results shown in the table below, where the relationships between items are measured by "confidence" and "lift". Confidence: This is a measure that shows the likelihood that Item B is purchased when item A is purchased. In this case, root vegetables are purchased with a confidence of .43 (out of 1) when onions and other vegetables are purchased. Lift: This is a measure that quantifies the significance and uniqueness of a purchase relationship. Higher is better.